Did you know you can bring Amaretto to your real life? Yes you can!!!!!!! Amaretto has a store that you can order items such as Women’s Apparel ,Cups and Mugs, Men’s Apparel and Odd’s an Ends . Now I know you’re asking where these items are and how do I get them? These items are on The Amaretto Store located on the Amaretto Social Network! I bet you can find something you like! The First Best In Show K9!!!!! Starting June 5th 2012 at 12:01 am SLT any Kennel dropped from the breeding of 2 Schnauzer’s you have a chance at the Kennel being an “Amaretto Best In Show Schnauzer”! That’s it! The only qualification is they both have to be Schnauzer, they can be any color! Mother & Father MUST BOTH be a Schnauzer. We will announce what Best In Show K9 when it is close to the end of the 30 days of Schnauzer! Keep your eyes peeled as you won’t know what the“Amaretto Best In Show Schnauzer” looks like until it hits the grid ! This “Amaretto Best In Show Schnauzer” will have a chance of passing its special eye and collar! So Amaretto community… gather up your Schnauzer’s and get them ready for an excitement filled month of breeding! Well good luck everyone and get those Schnauzer’s out and get to breeding, until next time Happy Breeding!! And the next Showhorse is!!!! Starting June 05, 2012 Amaretto is introducing a new Show Horse from June 5th 2012 to July 5th 2012 . We move from Tmzasz’s favorite Clydesdale to a Community favorite Appaloosa!! Starting June 5th 2012 at 12:01 am SLT any bundle dropped from the breeding of 2 Appaloosa’s you have a chance at the bundle being an “Amaretto Appaloosa Showhorse”! That’s it! The only qualification is they both have to be Appaloosa, they can be any color! Mother & Father MUST BOTH be Appaloosa. We will announce what horse is next close to the end of the 30 days of Appaloosa! Keep your eyes peeled as you won’t know what the“Amaretto Appaloosa Showhorse” looks like until it hits the grid ! This “Amaretto Appaloosa Showhorse” will have a chance of passing its special eye! So Amaretto community… gather up your Appaloosa and get them ready for an excitement filled month of breeding! Well good luck everyone and get those Appaloosa out and get to breeding, until next time Happy Breeding!! Auction for a Cure Reminder!!! Happy Memorial Day everyone!!! If you aren’t in the US and dont celebrate that Happy Monday to you! Thanks to all who came out and celebrated with us at Club Amaretto. 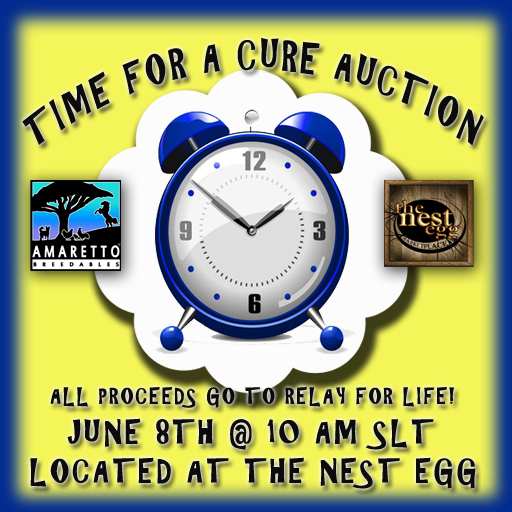 So I wanted to take one more opportunity to shout from the roof about the Time for a Cure Auction that Amaretto will be hosting on June 8th! Incase you live under a rock, all proceeds go to Relay for Life! Now I will be the auctioneer for a day and you never know what you might see up on the auction block. So what does this all mean? Well it means you need to get registered so you can bid!! How you ask? Well its simple you can send Avalon Crystal a note card that says I want to bid. I will be sending out group invites soon as well as setting out some of the animals that you can bid on! IF YOU DO NOT REGISTER YOU CAN NOT BID ON THESE ITEMS!!! If you would like to donate a animal for the auction please contact Jaymee Caproni! Until next time Happy breeding everyone! Don’t buy/sell horses to avatars that are only one day old. TGIF! I spent today going over the notes from the two AMOC meetings yesterday and pulling from them items that could be addressed in my Customer Connection. What I discovered is that most of the information that was being asked for is already available and easy to obtain. Let me start with the idea of providing a list for what “is and isn’t” considered a trait. This is on each wiki manual that is available for each animal. Those pages are all listed on the HELP tab of the Amaretto website. The Amaretto wiki’s that are a source of great pride for the entire staff as we work very hard to provide the community with the best possible information about Amaretto Breedables. Another thing that was asked for was a list of landmarks be provided for newer breeders. As you found out in the Customer Connection from yesterday there is now a Store Locator on the Amaretto website! Just log in to the website and below your picture you can find that option and everyone can easily make their way around! This Store locator is very cool! So I cannot encourage you enough to become familiar with all things on the Amaretto website it is filled with a plethora of information on each Amaretto Breedable! New Feature Added To The Social Network! You will then be redirected to the “Stores Locations” page! 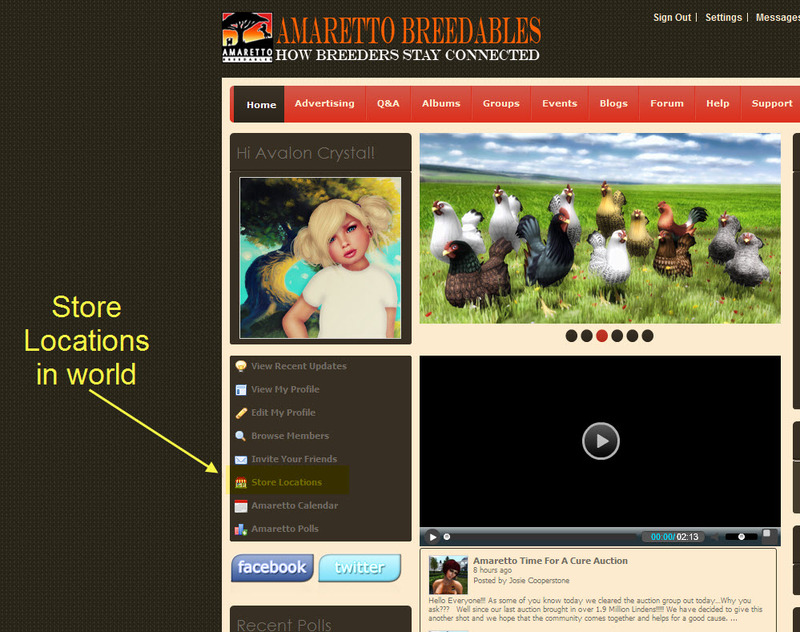 Once there you will find a full and current list of all Amaretto Ranch Breedables locations. You will also notice little icons next to the location. This is the current lag status at that location. You can refer to the Legend at the top of the page for a description of these icons. Next to the icon you will see the current sim status for that particular location. And finally, next to the sim status information you will see a “Go Here Now” button. This button will send you a landmark in world so that you may teleport and visit that location. We hope you enjoy our new feature and hope it helps make your breeding lives a little bit easier. OH !!!!!!! OH !!!!!!!!!! I am so excited guess what was found on the grid ! the Exotic Birds have the possibility of being found in the Starter Packs. does not pass its eye. As some of you know today we cleared the auction group out today…Why you ask??? Well since our last auction brought in over 1.9 Million Lindens!!!!! We have decided to give this another shot and we hope that the community comes together and helps for a good cause. Now I will answer a few questions that some of you might have. Well Amaretto is taking donations for this auction we do ask that any horses sent in to be higher than 8 traits or new or charmed and for the k9s we ask to be at least 3 traits on the k9s or new or enchanted and also the barnyard birds we will take any of them that you wish to donate. We do ask that you limit your items to 2 per person. Please send these donations in a folder with your full sl name and Amaretto Auction as the folder name with a detailed note card explaining why you wanted to donate to Jaymee Caproni! Donations will only be accepted until June 5th at noon. We realize like last time that not everyone will be able to get on the sim the auction will be done in voice over a stream and you will be assigned a proxy to place your bidding threw which will be a Amaretto Staff Member if you would like to sign up to bid please title the note card I want to bid (your name) please only send one note card to Avalon Crystal! As always we hope to see you there!!! What a wonderful way to start the week! Everbody should go out and meet new people, laugh and enjoy hanging out and talking about their breedables. 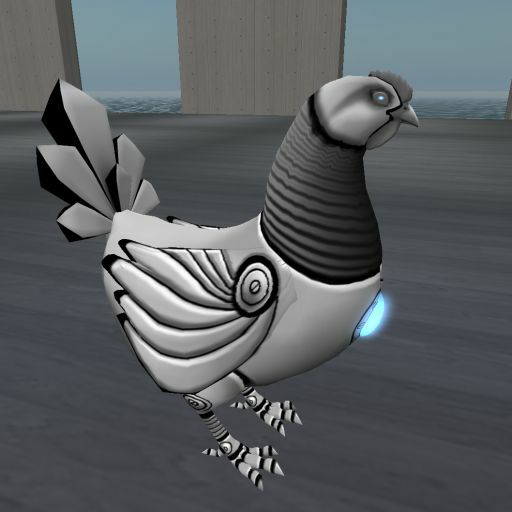 Most of you know me as the name of one of the people that fixes your breedable, and I know you as one of the names of the people that send in tickets. It’s really so nice to actually meet . I was at Boomtown in the morning hours and this afternoon at the Amaretto Store at Precious Stables. Talk about fun, and exciting.! I got to actually meet and spend time chatting with some of you. Everyday the CSRs will be hoping around to all the Amaretto stores and Boomtown for hour long Q & A’s. So if you have a question, or just want to hangout for awhile with us, watch for the group notices and you will get a landmark to where we are. We look forward to meeting and spending time with all of our Amaretto Family. And quess what…. when we have to leave, the stores are in markets…. and you can go shopping.! Looking forward to meeting you soon!!! !